Create a Gourmet burger with personality following the guidelines below and you could win a $10,000 scholarship and the opportunity to serve your burger at the Food Network & Cooking Channel South Beach Wine & Food Festival (February 22-26, 2017) - Heineken Light Burger Bash presented by Schweid & Sons hosted by Rachael Ray, the night of Friday, February 24. In addition, your burger may also be included on Red Robin Gourmet Burgers' menu in 2017 or 2018. Gourmet Burgers are the foundation for Red Robin Gourmet Burgers and Brews. A Gourmet burger to us is one with a fun, creative and craveable combination of flavors and textures that come together perfectly into a memorable burger experience for the guest. 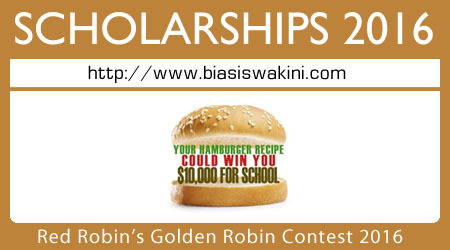 0 Komentar untuk "Red Robin's Golden Robin Contest 2016"